Gov. Greg Abbott's personal Twitter inbox is a direct line for a group of about 3,000 users to reach Texas' top politician, which some have used to ask for jobs and other favors. On Feb. 13, 2015, a Twitter user under the alias “Conservative Crucian” sent Gov. Greg Abbott a private message to say she was looking for a job. The user, whose real name is Jacquie Baly, had just submitted an application for one of three openings on the governor-appointed board of regents for the University of Houston System. Abbott did not respond to the message. Nor did he name Baly to the board of regents — those positions went to major campaign donors. But within six months, Abbott’s office had found a different appointment for her — this one on an advisory board for the governor’s newly-created University Research Initiative, which doles out funds to lure top researchers to Texas universities. “Jacquie’s knowledge and experience will be invaluable” to the board, Abbott said at the time, according to a local news story. Baly did not respond to phone calls or emails seeking comment. In some ways, the exchange was typical for Abbott, an avid Twitter user whose personal account boasts more than 171,000 followers. A more reclusive governor than his predecessor Rick Perry, Abbott shies away from interviews with mainstream media outlets and occasionally appears on conservative talk radio shows. Instead, social media — in particular, his personal Twitter account — has become the governor’s preferred means of publicly signaling his political desires and intentions. One Capitol insider described Abbott’s Twitter feed as a “thermometer” for gauging the temperature of the governor — who often keeps his opinions to himself during political fights at the Capitol — on high-profile political issues. The exchanges show that Abbott rarely responds to his direct messages in writing, but in at least in some cases, records suggest he may have taken those messages and requests into consideration on a wide range of issues from gubernatorial appointments to foreign policy. They also show that the governor’s private Twitter inbox has served as a direct line for a group of fewer than 3,000 mostly conservative users to ask for appointments, make policy recommendations and seek out other favors. The requests range from routine to outlandish. Twitter users with as many as 58,000 followers and as few as 600 have asked Abbott to declare a state of emergency for a flooding region in East Texas (he did), to demonstrate his support for Israel (he did), to endorse a program that provides public university tuition benefits for veterans and their children (he did) and to retweet a message about a talk radio host’s missing daughter (he did not). 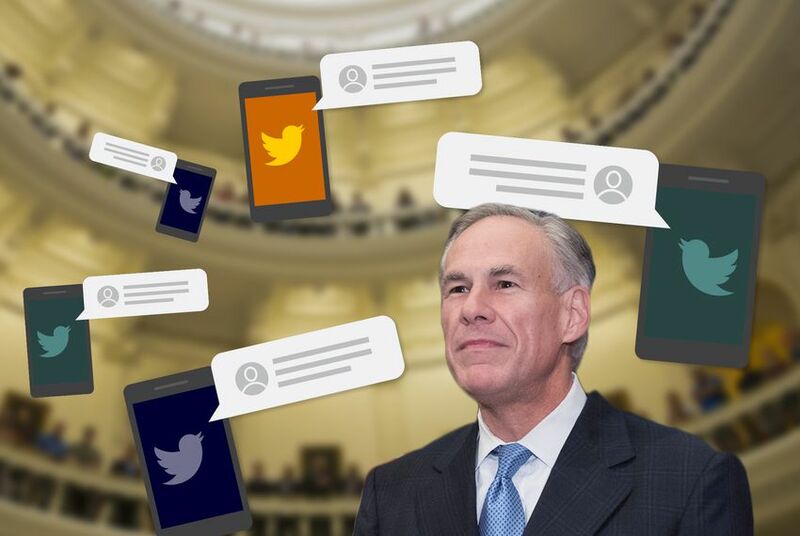 A spokesman for Abbott said the governor takes his social media messages seriously, in addition to the more old-fashioned forms of communication Texans may use to get ahold of him. “Governor Abbott’s No. 1 goal is to create a better state for the people of Texas, and he is constantly listening to the concerns of his constituents, whether at public events, through letters and phone calls to his office or through messages sent to him via social media, to better inform public policy,” John Wittman, the spokesman, said in an email. Tom Gibson, a Houstonian who said he voted for Abbott but has not met him personally, sent Abbott a direct message two years ago with a foreign policy question. Though Gibson only has about 600 Twitter followers, they include some high-ranking Texas Republicans, including Abbott, Lt. Gov. Dan Patrick and U.S. Sen. Ted Cruz. “Can Texas bypass the federal government and offer Israel its support?” he asked in a message dated March 20, 2015. Abbott did not respond, but a few weeks later, the governor celebrated Texas-Israel Day at the Capitol, a fact he touted soon afterward in a letter to Congress urging support for Israel and opposition to the Obama administration’s nuclear deal with Iran. “It’s hard to tell the inner workings, but I always assume that someone’s going through [social media] and saying, ‘Hey, look what people are talking about. Maybe we should do something,’” Gibson said in a telephone interview. When Brent Munlin of Corpus Christi sent the governor a message in March 2016 about the possibility of his mother’s East Texas home being flooded, Abbott likewise did not respond. But the next day, the governor declared a state of disaster in the county where she lived. Does Munlin think Abbott read his message? Abbott reportedly controls his personal Twitter account and has made social media a key part of his political strategy, using it to communicate directly with his base and with other elected officials. One of the governor’s first forays into the debate over which bathrooms transgender Texans should use, which became the most hotly contested issue of the 2017 legislative session, came in the form of a tweet published by the governor’s personal @GregAbbott_TX account. It was February, one month into the legislative session. Patrick had already begun a forceful push in the Senate in support of the bathroom bill. House Speaker Joe Straus and his lieutenants in the Capitol’s lower chamber appeared to be gearing up to kill the legislation. Abbott, meanwhile, was playing coy, declining to say publicly which side he favored. But when the National Football League suggested it might not host any future Super Bowls in Texas should the state pass a “discriminatory” bill, Abbott took umbrage — and opened up Twitter. During the recent special legislative session, Abbott used Twitter to send seven thank-you tweets addressed to the Senate for making progress on bills he favored. By the latter part of the session in August, with one exception, he stopped tweet-praising the House, which had bottled up much of Abbott’s agenda. The governor’s Twitter feed these days is a hodgepodge of campaign posts (#ImWithAbbott), messages of support for his favored state lawmakers (mostly Senators, of late), links to news articles (many of them from conservative websites, with a special focus on crimes committed by unauthorized immigrants), and the occasional Sunday Bible verse or Christian meme (“No God, no hope; Know God, know hope”). He tweets frequently using the hashtags #tcot (short for top conservatives on Twitter) and #txlege (an abbreviation of Texas Legislature). For the most part, he follows news media outlets — both of the mainstream and right-wing varieties — and other politicians, but his feed also draws from a large group of lesser-known figures. These profiles appear mostly to belong to conservative Texans; roughly four dozen list #tcot in their bios, with other popular tags being #ProLife and #MAGA, short for “make America great again,” the slogan popularized by President Donald Trump. In total, 2,965 accounts have permission to send him private messages. Abbott’s Facebook, on the other hand, is a staff-run account that often shares professional videos produced at the governor’s third-floor campaign headquarters in downtown Austin. Earlier this year, Abbott signed a controversial immigration bill into law and broadcast it on Facebook. In doing so, he bypassed traditional media outlets and the horde of protesters who likely would have turned up to the bill-signing ceremony. Abbott’s video has been viewed nearly 1 million times.